There’s nothing like spring to put you in the mood for new beginnings. Unfortunately, the new season has yet to settle in, with the erratic weather taking center stage and denying you any semblance of spring. With the weather being so unpredictable, you just don’t know what you’re going to get. 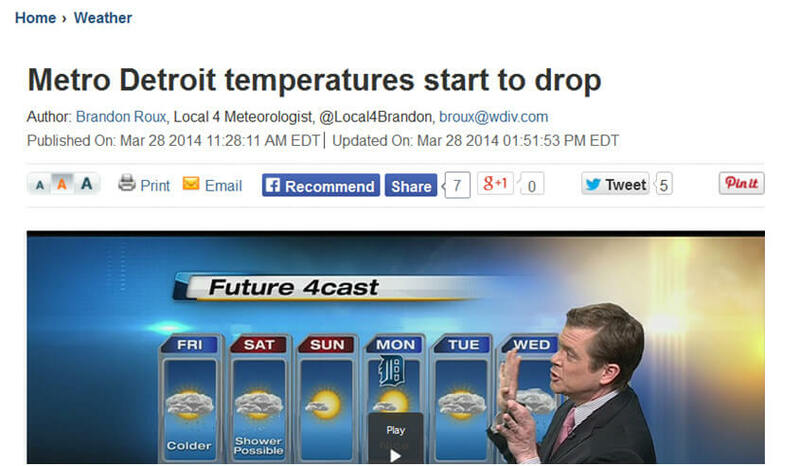 Temps are on the move … and, they’re headed in the wrong direction. A cold front moving through the Friday lunch hour and early afternoon is bringing scattered showers and cooler air. This front will change breezy conditions in Metro Detroit from the milder winds SW 15-25 to more WNW 10-25 mph this afternoon. We will see the clouds breaking apart later this afternoon with a little bit of blue sky to end the day. Saturday will stay cool with lows down in the upper 20s and increasing clouds once again. There’s a storm moving up from Texas bringing the chance of a wintry mix midday especially in our southern counties closer to the Ohio border. You should know, however, that it is still up to you to ensure that your home will be able to withstand all this abuse. If you were waiting for an opportunity to take better care of your home, now is your chance. New Detroit windows are an excellent start so you can regulate the temperature indoors more effectively. Cold drafts won’t do you any favors and if you allow air leaks to carry on indefinitely, you’re allowing your home to deteriorate faster. If you’re considering getting replacement windows in Detroit to combat the elements, getting the help of contractors like Kroll Construction is your best bet. The company carries the top brands in the industry and is recognized as fully qualified to install and service their products. The members of the Kroll Construction team carry the following certifications, having been fully trained by the manufacturers themselves: IKO, GutterCap, Alside, and Owens Corning. All products installed by Kroll Construction come complete with valid manufacturer warranties for your protection. Need to work on a tight budget? They also have plenty of financing options.